Safe Harbor performs Habitat restoration work on eroded beaches; inland sites and steep slopes. Our coastal dunes, beaches and banks, perform in the PublicInterest by absorbing Storm Energy. This may contribute significantly to stabilization but cannot reverse the overall "net loss" from our coastal erosion process on the Outer Cape. Sustainable practices and responses view these habitats as "systems", linking geomass, biomass and the energy that drives through them. This systems approach can focus restoration effort, minimize loss and prevent additional, unnecessary losses from anthropogenic impacts. In some, site specific cases (shown below), it is possible to restore geomass and re-connect eroded profiles. Outer Cape coastal habitat is made up of sand and grass, ocean, wind and people. Safe Harbor's restoration strategies use the systems approach, incorporating natural energy forces in each habitat. In some cases, the energy we utilize to restore an area, such as wind, is the same energy that has eroded the area. We use low tech, low profile, restoration systems. In a way, our approach is similar to baking bread: you need to know the the relationships between ingredients, put them together, expose the ingredients to energy and get out of the way. Except our "oven" happens to be the North Atlantic coast of Cape Cod. While semi soft and soft solutions may incorporate some elements of restoration, we will be discussing alternative # 5: sustainable coastal habitat restoration. Remember the caveat that the coastal erosion process is site specific and based on net loss. Restoration strategies may not be interchangeable or appropriate for every case. We believe that habitat systems, if restored to sustinability, minimize net loss by allowing the system to respond to the coastal process. We will use Case Study #2, on Cape Cod Bay and Case Study #3, on the Atlantic Ocean, as models for our techniques. Sustainable habitat restoration is a unique alternative because it doesn't just respond to the problem, it addresses the cause of the problem as part of the solution. In these two case studies, we will share our protocols for restoration and a little of our assessment process. Any coastal erosion site represents a unique set of factors and should be assessed carefully. In case study 2 and 3, anthropogenic impacts removed vegetation, exposing the land form to mass reducing erosion. Our restoration solutions incorporated the same wind that eroded these areas, to restore them. Habitat Restoration may not be an acceptable alternative in every case. Residents crossing a dune along a public landing damaged beach grass. The missing grass allowed winds to scour a 14' deep hole on the beach and pile the excess sand 14' high, on the top of the path. Residents now needed to negotiate a 28; drop and climb to get to the beach. As a result they began short cutting across an abuttor's property, which also began eroding. While this project may seem like a "soft" project, the renourished sand was critical for storm damage prevention. After that sand was in place, we plugged in our fairly low tech restoration system. 24" sand fencing was installed in 4'wide, parallel rows, beginning at the toe of where we wanted to restore the dune. 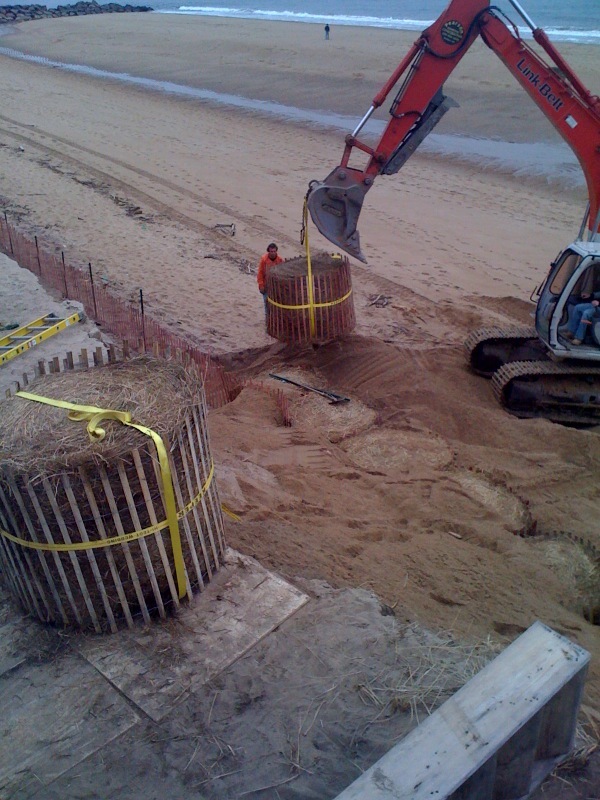 As sand fills in, we will adjust new fencing to link to the adjacent dune, on each side. Grass plantings, on this site, are critical to creating sustainable habitat. This image, taken one year later, showing new sand collected from storm winds, which will continue to restore this dune. Planted beach grass will grow right up through the collected sand. Municipality experimentation with Hay-Bale techniques. Safe Harbor Director Gordon Peabody, shown here with Newburryport Conservation Agent Julia Gotfreidson, inspect ongoing coastal beach and dune erosion. Shown here, Geo-tubes, are one of the techniques the municipality was already working with is considered a semi-soft solution because it incorporates sand to absorb energy instead of stone, which would re-direct the energy.